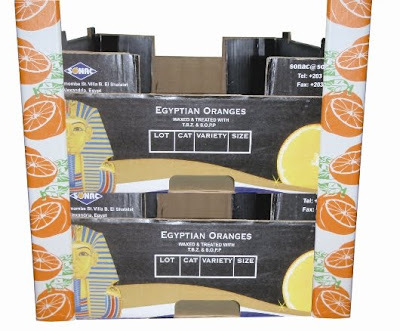 Unipak Nile manufactures recyclable pallet edge protectors for fresh fruit and vegetable exporters in the Middle East and North African (MENA) region. From its plant in 6th of October City, Egypt, Unipak Nile manufactures 100% recyclable edge protectors to safeguard stacked agricultural trays on pallets. Exporters can efficiently strap pallets horizontally to prevent corrugated trays from collapse, damage and side crushing during transport and refrigeration. Trays are delivered intact to retail stores. Unipak Nile manufactures a range of other recyclable corrugated packaging for the agriculture industry, such as corrugated banana cartons, corrugated bulk bins, corrugated trays for packing and dispensing fresh produce and corrugated open-top trays for fresh produce. Produce boxes and trays are used to pack and transport apples, bananas, broccoli, cauliflower, cherries, citrus (tangerines, mandarines and oranges), cucumbers, dates, eggplant, grapes, green beans, lettuce, melons, necatrines, onions, peaches, peppers, potatoes, pumpkins, squash, strawberries, and tomatoes. Unipak Nile is a member of INDEVCO Paper Containers Division, a division of INDEVCO Group, the local multinational of the Middle East.